America is a land full of tremendous natural beauty, and for anyone who loves to throw on a pair of boots or sturdy sneakers and set out to experience nature in its perfect setting, Route 66 offers a large number of choice spots that will have you in your element. After countless hours or days in the car driving Route 66, you'll probably get the urge to get out and stretch your legs. And what better way to do so than with a rejuvenating hike in the breathtaking natural landscapes surrounding the Mother Road. From mountain ranges to desert landscapes, extinct volcanoes and so much more, there is a whole other world to discover on foot. So park the car, lace up your shoes, and get stretching, because we have the 10 best hiking spots along Route 66. With its lush grass prairies and rocky mountains underneath vast blue skies, Oklahoma is an excellent - yet lesser known - hiking destination. 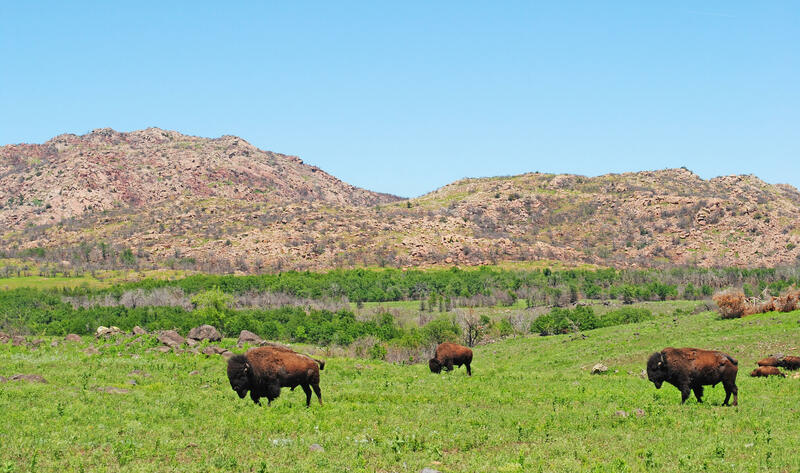 Wichita Mountains Wildlife Refuge (image above), just under two hours southwest of Oklahoma City, has over 59,000 acres of protected land and provides habitat for large native grazing animals such as bison, elk, and deer, among hundreds of other birds, reptiles, and mammals. Hikers are spoiled for choice here with 15 miles of hiking trails that traverse dramatic pink granite mountains, vast seas of prairie grasses, and verdant forests - with stunning wildlife to match including majestic buffalo, electric blue lizards, and the rare black-capped vireo with its haunting birdsong. The 1.1 mile Elk Mountain Trail is a must, topping out on a summit with spectacular views of the refuge. For more information on the refuge and its hiking trails visit the Wichita Mountains Wildlife Refuge website. Just west of metro St. Louis, you'll find the family friendly Route 66 State Park that blends Mother Road history with a nature getaway. A portion of the original Route 66, as well as a historic bridge across the Meramec River, runs through the park, and their visitor's center is housed in a 1935 Route 66 roadhouse. Within, you'll find Mother Road memorabilia, historic souvenirs, and information about the former town of Times Beach. Outside, there are numerous walking, biking, and equestrian trails that are perfect for people of all abilities, including persons with disabilities. The park is home to oak, hickory, river birch, cottonwood and pine trees as well as a diverse set of plants, many deer and wild turkeys, and more than 40 types of birds. 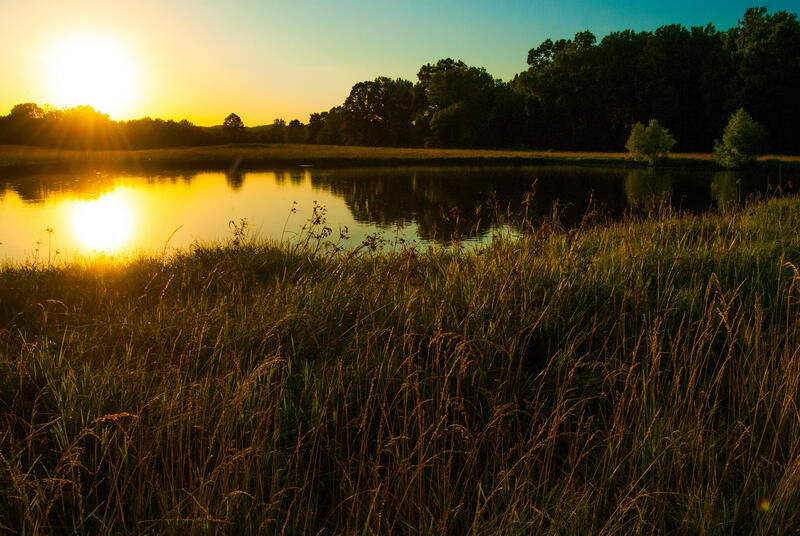 Route 66 State Park is the ideal place to rest, have a picnic, and be reinvigorated by the splendor of nature. For more information check out the Route 66 State Park website. Often a must-stop along Route 66 is the Grand Canyon in Arizona, but unbeknownst to many travelers, Texas has its own Grand Canyon. 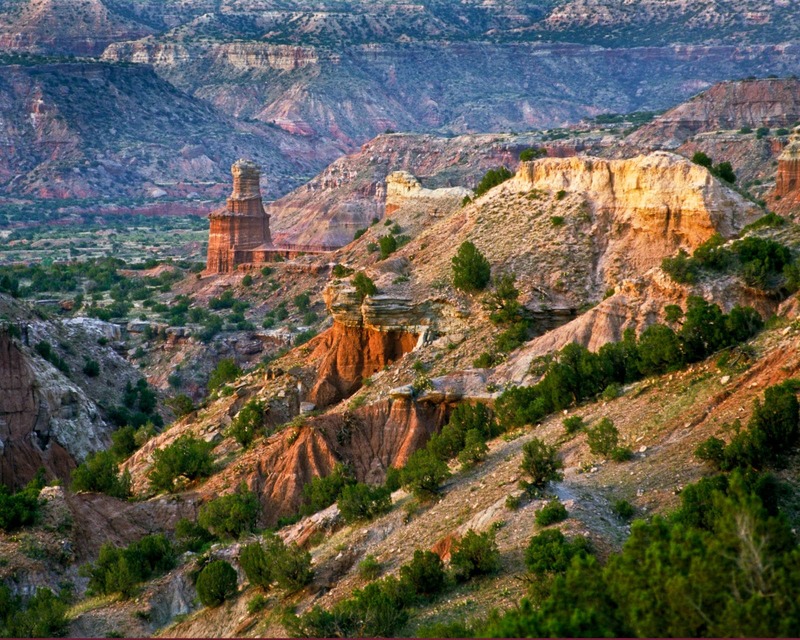 Palo Duro Canyon, 30 minutes south of Amarillo, is the second largest canyon in America at 120 miles long and 20 wide. And with its rugged beauty and colorful history (humans have resided in the canyon for approximately 12,000 years), you'll see why Texas's Grand Canyon is first-rate. For hikers, there are over 30 miles of trails ranging from easy to difficult, offering treks to the canyon floor, hillside caves, and the park's iconic Lighthouse rock formation. Look out for Texas horned lizards, visit the Cowboy Dugout to see how cowboys lived in the 1880s, ride a horse through the former grazing lands of the historic JA ranch, or camp for the night on the canyon floor. Whatever trail you choose, Palo Duro will provide an unforgettable journey. See more at the Palo Duro Canyon State Park website. Petroglyph National Monument offers a perfect blend of history, culture, and nature in a serene and stark landscape scattered with symbols. 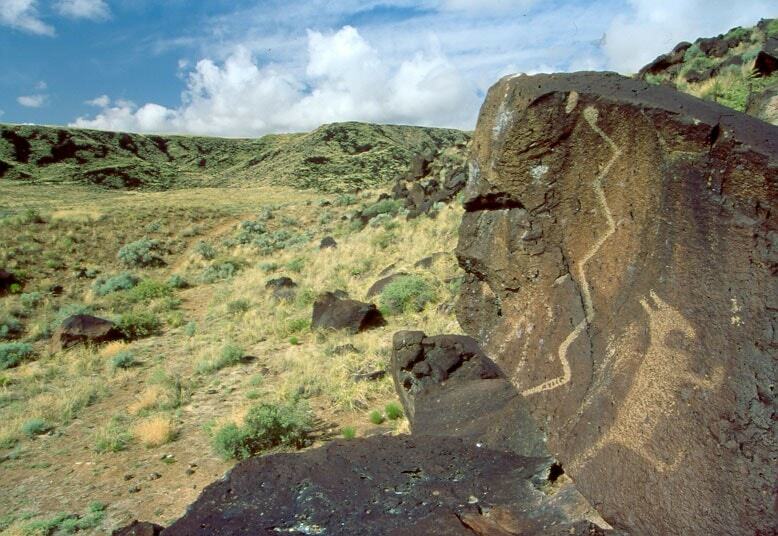 The petroglyphs feature designs and symbols carved into volcanic rocks by Native American and Spanish settlers 400 to 700 years ago, in one of the largest petroglyph sites in North America. There are several hiking trails ranging from 1-4 hours traversing past the remnants of erupting volcanoes and thousands of petroglyphs, sand dunes, canyon beds, and scenic views of the Rio Grande Valley, Albuquerque, and the Sandia Mountains. Visit the Petroglyph National Monument website to learn more. It is worth stopping the car just outside of Grants along Route 66 to experience the badlands of New Mexico. With its diverse volcanic landscape including sandstone bluffs, forests, grasslands, and lava tube caves, El Malpais National Park is known as the land of frozen fires. From strenuous treks over jagged lava flows to moderate loops in the trees, El Malpais has many hikes for people to explore and caters to all skill levels. 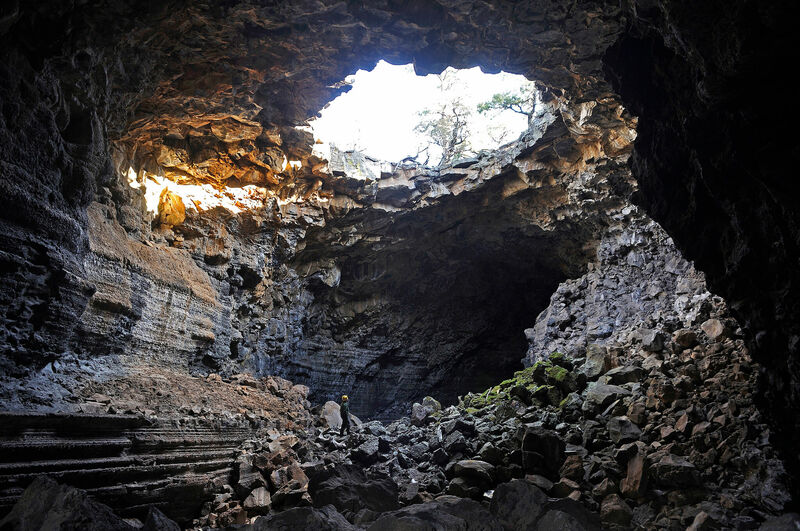 Experience the underground cave world of lava tubes, watch an outflight of inky bats, hike a cinder cone volcano, or climb the sandstone bluffs and gaze out at the vast lava expanse. Walk where Ancient Indian civilizations crossed the lava flows and developed ceremonies related to the landscape, or see remnants of lonely homesteaders who tried to make this hostile environment thrive. Begin your journey to the land of fire and ice at the El Malpais website. The colorful expanse of the Painted Desert is a hallmark of Route 66 in Arizona, and Petrified Forest National Park is the only park in the National Park System containing a section of historic Mother Road. Since the 1920s, the glimmering pink edifice of the Painted Desert Inn was the oasis in the desert for Route 66 travelers, and it is now a functioning museum within the park. Accessed right off Route 66 between Sanders and Winslow, Petrified Forest National Park offers numerous hikes for all skill levels. Try the Historic Blue Forest Trail for an adventurous hike that offers stunning views of the blue and white badland hills, or experience the solar marker petroglyph on the one mile Martha's Butte trail. For a unique and unforgettable experience, reserve one of the three permits available weekly for the Devil's Playground. This otherworldly and strangely beautiful part of the park is highly eroded and features incredible rock formations and the alien-looking Hoodoos tower. Visit the Petrified Forest National Park website for more information. If a paved trail and city setting are more your speed, then the Route 66 Trail in Flagstaff is just what you're looking for. 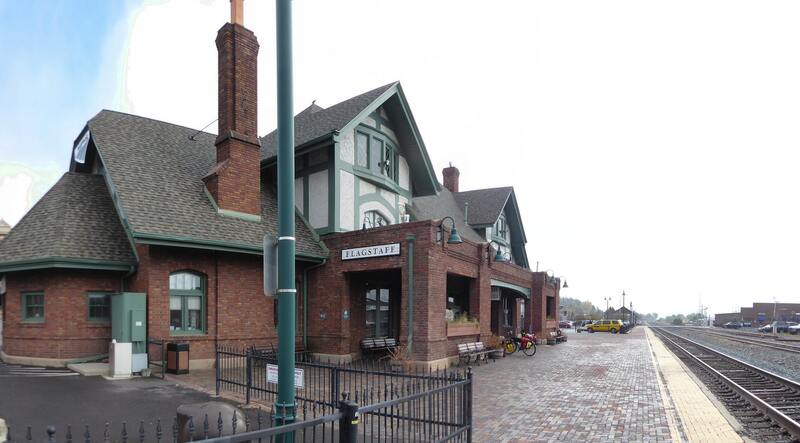 This urban trail begins in the historic downtown of Flagstaff, next to the picturesque train depot, and follows old sections of Route 66 through the city for over 4 miles. This popular trail is pet and family friendly and allows you to walk the old mother road while exploring the city, with views of the San Francisco Peaks beyond Flagstaff. The trail also connects with the Arizona Trail, an 800 mile trail that crosses Arizona from Mexico to Utah, if you want to extend the journey further. For more information, check out the Route 66 Trail website. Just beyond the 1950s Route 66 time capsule of Amboy lies the 6,000 year old extinct volcano of Amboy Crater. A 3-mile round trip trail leads up and into the 250 ft tall crater, continuing around the rim, with awe-inspiring views throughout, of a landscape transformed by volcanic ash. With no hint of civilization in sight, there is a deep sense of serenity and solitude here. Visit in late January through March to see the desert landscape blanketed in wildflowers, but try to avoid visiting in the middle of the summer as the temperatures rise dangerously. There is a shaded crater viewing platform, picnic tables, and trail information at the site. Be sure not to miss this amazing and unique opportunity to hike a volcano while driving along Route 66 in California. 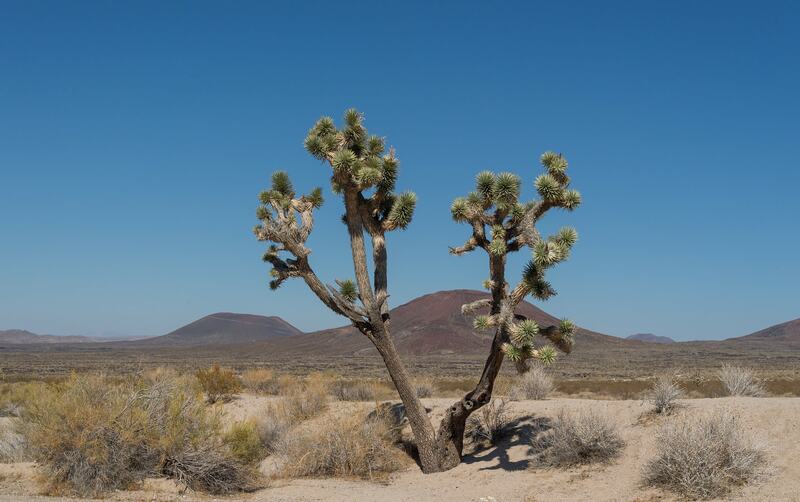 Not far from Amboy, between Needles and Ludlow, CA, lies the famous Mojave National Preserve. 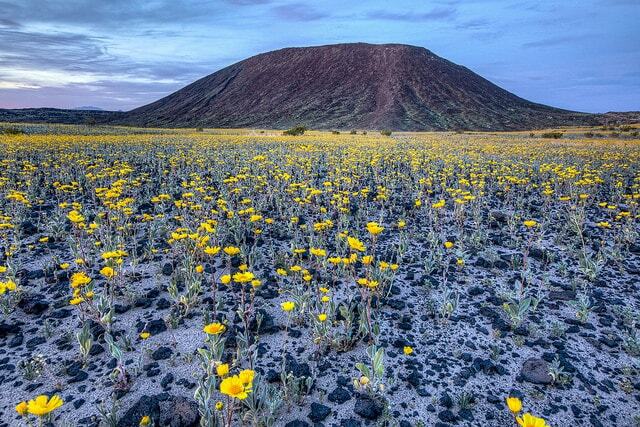 This 1.6 million acre park features mountains, canyons, singing sand dunes, volcanic cinder stones, Joshua tree forests, and blankets of wildflowers. The park also has a diverse range of wildlife including mountain lions, bighorn sheep, bats, chuckwallas (the second largest lizard in the US), and golden eagles. This diverse and teeming landscape makes for a vibrant hiking experience. There are several established hiking trails, and numerous abandoned dirt roads, washes, and ridge lines offer ample opportunity for cross-country hiking. 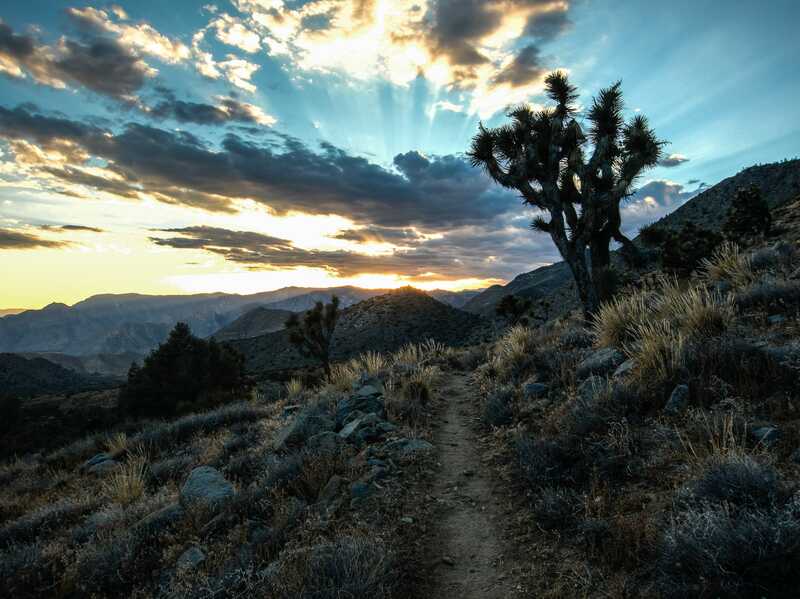 Developed trails range from an easy trail around Lake Tuendae to a hike through the world's largest and densest Joshua tree forest to a rocky peak with expansive views of Cima Dome. Whether you stay on the trail or venture off it, you're guaranteed a memorable experience at Mojave National Preserve. For trail info and more, see the Mojave National Preserve website. The trail that unites a continent is also fittingly connected to the route that unites America. The Pacific Crest Trail is a long-distance hiking trail that runs from Mexico to Canada and is closely aligned with the highest portion of the Sierra Nevada and Cascade mountain ranges. This famous trail, featured in the movie Wild with Reese Witherspoon, passes through 25 national forests and 7 national parks, making it one of the most stunning trail ranges anywhere. The PCT can be accessed just north of San Bernardino from an old section of Route 66 now called Wagon Trail Road. This is the only place where the PCT junctions with the route, and offers a unique blend of American road history and natural splendor. After driving across the country on the mother road, perhaps the PCT will inspire you to traverse it by foot!